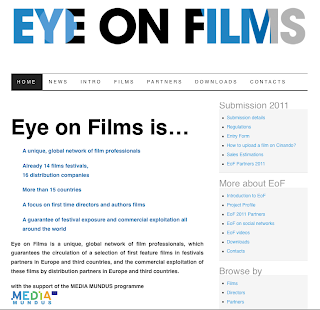 Created in January 2011, Eye on Films is a unique, global network of film professionals, which guarantees the circulation of a selection of first feature films in festivals partners in Europe and third countries, and the commercial exploitation of these films by distribution partners in Europe and third countries. Anybody can submit a film. All films submitted must fulfill the Submission requirements detailed in the EoF Regulations. Rights Holders (producers, sales agents...) must agree on the EoF Regulations and return the Entry form duly filled and signed, before applying. We are looking for recent works (completed after Oct 31st, 2010) from first time directors, preferably never screened outside their country of origine. Rights Holders should upload their Film on Cinando’s Online Screening Room (www.cinando.com) and then notify submission@eyeonfilms.org by sending the Entry Form. Find out more about submission requirements and guidelines here.